I'm joining the "I'm a Flea Marketeer Party" over at flea market style and I'm linking up my all time favorite thrifty find. I found this dresser in the classifieds and it made the perfect entertainment center with a little work. I LOVE repurposing furniture and other things. It has sorta become one of my favorite hobbies lately. Things that I create or repurpose have so much more meaning and character than anything I could pick out of a catalogue (They are a lot cheaper too). 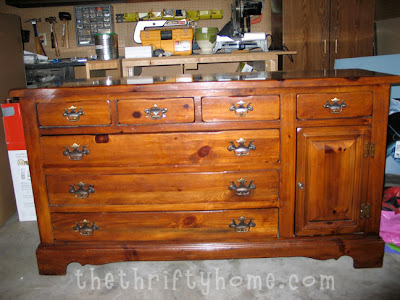 To see my full post about this dresser turned entertainment center click HERE. Hmmm... "repurposing"? Do you think I could do that with, say, MY HUSBAND? LOL! Seriously, the dresser's lovely! Ooh! What a great job you did on that! Perfect! I bought some old pieces this summer and they are still waiting for me to get inspired. Love flea markets and yard sales. Our entertainment center is also an old dresser. It's so fun to give old items a totally new life, isn't it? Great project! Thanks for sharing. What a great re-do! Love your choice of replacement door hardware, and the paint color is just perfect. Oh WOW that dresser looks so great. You did a fantastic paint job! Better than Pottery Barn. Well done. This is something I just love to do. And you accomplished making something perfectly custom for you needs. 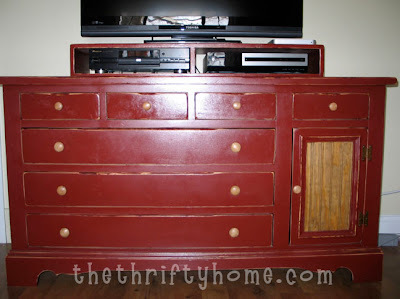 Love the red, visiting from SITs -- I love what a new coat of paint can do for a piece of less than lovely furniture!! entertainment center also determines the setting of the entire room.